MEDAGLIA D'ORO (USA) (Bay or Brown 1999-Stud 2005). 8 wins to 1¼m, Gulfstream Donn H., Gr.1. Sire of 1079 rnrs, 701 wnrs, 110 SW, inc. Talismanic (Breeders' Cup Turf, Gr.1), Songbird, Rachel Alexandra, Vancouver, Passion for Gold, Marketing Mix, Mshawish, New Money Honey, Plum Pretty, Bolt d'Oro, Elate, Champagne d'Oro, Gabby's Golden Gal, Astern, Coffee Clique, Dickinson, Lochte, Violence, C.S. Silk, Bar Of Gold, Warrior's Reward, Valid, etc. League of Nations (g. by Medaglia d'Oro). See below. L'ESPERANCE (Marscay). 8 wins from 1200m to 2000m, R410,055, Bloemfontein Thaba'nchu Sun Casino S., Gr.3, Greyville Double as Much Fun H., Workplace H., 2d Greyville King's Cup, Gr.3, Newmarket Victory Moon H., Gr.3, 3d Turffontein Hyperion H., L, 4th Clairwood Christmas H., Gr.3. MARTREE (Marscay). 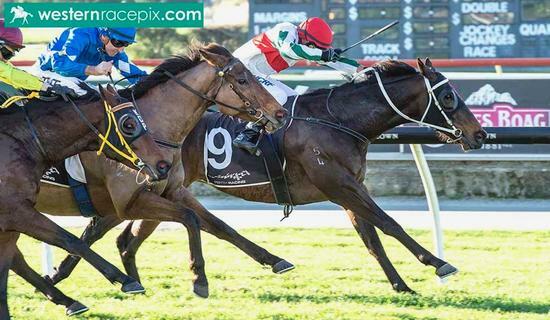 2 wins-1 at 2-at 1200m, 1500m, A$291,300, Illawarra 2YO Classic, Gr.3, STC Wicked Wines Flying Welter H., 2d Hawkesbury Guineas, L, AJC Breeders' P., L, STC Hudson Timber & Hardware Welter H., 3d STC Silver Slipper S., Gr.2, Gosford Guineas, L, 4th STC Canterbury Guineas, Gr.1. Sire. KIMBRIDGE KNIGHT - PEAK OF PERFECTION XI (Mal.) (Night Shift). 12 wins from 1900m to 2400m, £10,822, A$22,500, 908,528Rgt., S$357,298 in Ireland, Malaysia and Singapore, Singapore Derby, L, Perak Derby, L, Selangor TC Tunku Gold Cup, L-twice, 2d Penang TC Yang di Pertua Negeri Gold Cup, L, 3d VATC Sandown Cup, Gr.2. MAURI MOON (Green Desert). 4 wins-2 at 2-from 6f to 8¼f, Goodwood Oak Tree S., L, Chester Combermere 2YO S., 2d Kempton Masaka S., L, 3d Goodwood Oak Tree S., L, 4th Newbury Ballymacoll Stud S., L. Producer. NOBLE PROTECTOR (Haafhd). 5 wins from 1600m to 2400m, £48,021, A$489,500, MVRC Sunline S., Gr.2, VRC Schweppervescence Trophy, Gr.3, Newmarket Aphrodite S., L, 2d MVRC Sunline S., Gr.2, MRC David Jones Cup, Gr.3, Goodwood Daisy Warwick S., L, 3d ATC Queen of the Turf S., Gr.1-twice, York Galtres S., L, 4th VRC Queen Elizabeth S., Gr.3. ALL SHAMAR - EXQUISITE CHAMPION (H.K.) (Shamardal). 3 wins-2 at 2-from 1400m to 2000m in France and Germany, Dortmund Grosser Preis der Wirtschaft, Gr.3, Saint-Cloud Prix Isonomy, L, 2d Frankfurt Fruhjahrspreis des Bankhauses Metzler, Gr.3. MOKABRA (Cape Cross). 3 wins at 2 in GB and Germany, Baden-Baden Maurice Lacroix Trophy, Gr.2, 3d Curragh Anglesey S., Gr.3, Tetrarch S., Gr.3. CATWALK (Shirley Heights). Winner at 2, Newmarket Sweet Solera S., L, 4th Ascot Autumn S., L.
GRAND DUCAL (Danehill Dancer). 3 wins-1 at 2-from 1500m to 2900m, £4,296, €103,010, A$48,360, Curragh Gallinule S., Gr.3, 2d MVRC Sportingbet H., 3d Curragh Futurity S., Gr.2, 4th Leopardstown Irish Champion S., Gr.1, Newmarket Superlative S., Gr.2, VRC Andrew Ramsden S., L.
AZMEEL (Azamour). 4 wins-2 at 2-from 7f to 10½f, Chester Dee S., Gr.3, Sandown Classic Trial S., Gr.3, Newbury Washington Singer S., L, Sandown 2YO S.
BEST OF DAYS (Azamour). 2 wins at 2, Newmarket Royal Lodge S., Gr.2, 2d York Acomb S., Gr.3, 3d Newbury Steventon S., L, Newmarket Godolphin S., L, 4th Windsor Winter Hill S., Gr.3. ROYAL BLUE STAR (Dalakhani). 4 wins at 1m, 8½f, £675, €84,415, Cork Platinum S., L, 2d Galway Topaz Mile H. Producer. UNDER THE EIFFEL (Mossman). 9 wins-1 at 2-from 1100m to 1600m, A$618,231, MRC Sandown S., Gr.3, TTC George Adams P., L, 2d MRC D'Urban S., Gr.2, Victoria H., Gr.3, Sunshine Coast Guineas, L, MRC John Dillon S., L.
TOWER OF LONHRO (Lonhro). 13 wins from 1200m to 2100m, A$520,043, WATC Grandstand Cup, L, 3d WATC Hyperion S., Gr.3, Strickland S., Gr.3, RJ Peters S., Gr.3. Tree of Heaven (Robellino). 5 wins from 1600m to 2400m in Denmark, Norway and Sweden, 2d Ovrevoll Morten Klaveness Minnelop, L, 3d Ovrevoll Morten Klaveness Minnelop, L. Producer. Tree of Life (Shirley Heights). 3 wins. See above. In Like Flynn (Handsome Sailor). 7 wins-3 at 2-from 7f to 8¼f in GB and U.S.A, York Walmgate Nursery H., 2d Kempton Heron S., L, Newbury Whatcombe 2YO Conditions S., 3d Newbury Watermill Conditions S.
Race Record: 8 Starts 0-3-3 A$32,355. Placed at 2 & 3 to 2017-18, 2d ATC Bowermans Furniture 2YO P., 3d ATC Pluck at Vinery P., TAB P., TAB H.